Super Mario 3D Land was the biggest-selling 3DS game of 2011 in the UK, according to the Association for UK Interactive Entertainment (UKIE). In second place was Mario Kart 7, with both Mario titles outselling Grezzo's N64 remaster The Legend of Zelda: Ocarina of Time 3D. Here's the full top five, followed by the DS top five, in which Professor Layton and Pokémon outsold everything to nobody's surprise. No surprise there, considering that SM3DL (and MK7) where the first major first party titles for the system. Really? And Super Mario 3D Land on 1st? Dude. I thought that was pretty crap. I've played better Mario games the past 5 years. I'm kind of through to go and save Princess Peach again, or atleast not to be amazed by the game anymore. They really should count both Pokemon version as one game. Red isn't better than Blue and vice versa. Hmm. Personally I prefer the French Bulldog Edition but congrats to Nintendogs!!!! OH, COME ON! MARIO KART 7 & WAS WAY BETTER! If you like racing games/playing online, you're going to say Mario Kart 7 is better; if you like platformers and playing solo, you're gonna say SM3DL is better. They're both great games, it just depends on what you're into. Personally I LOVE 3DL and am on my... 4th(?) playthrough. It's the most addictive, fun to pick up Mario platformer of all time for me. @zeeroid: HOW WRONG YOU ARE! White sold better so it's clearly the better version. Same rules apply for SM3DL. Good for Art Acadamy making the top 5! Surprising not to see Pilotwings Resort or Street Fighter IV on the fifth place. While Rayman 3D is a very good 3D platformer and has aged somewhat decently it's a bit sad to see Ubisoft didn't give the remake as much love as OoT got. The really sad thing is to see Moshi Monsters instead of Ghost Trick or Solatorobo in the DS charts though. I like how every DS game except the ones I bought are the top selling ones. Personally I prefer 3D Land to MK7 and I got both games. After doing two amazing Mario games on Wii, EAD Tokyo showed they know how to handle the plumber. Grumblebuzzz has a really good point, as Mario is mostly the only thing both games share. And of course White sold better: the White Forest promised a lot more Pokemon than the Black City. Wow. Look at Rayman sneaking in there. "Super Mario 3D Land Beats All in 2011 3DS Chart"
3D Land was an amazing experience. Rayman 3D!!!! I'm gonna buy that later on... Love rayman. The Wii top 5 was absolutely disgusting but the 3DS list for the most part makes me happy. The top 3 games are exactly as they should be. At least people who are buying it are buying actual good games for the system. Hopefully the North American list is similar. My favorite 3DS game was Rayman 3D, love that game, I still have the Dreamcast version which is pretty much the same. I love SM3DL and MK7, but I prefer Mario Kart 7, don't get me wrong I like both games a lot, but MK7 has a better online system than the DS version and the graphics are outstanding. I just wish that developers shouldn't leave the extra junk files in the game. For example, MSM (Mario Sports Mix) had three different Behemoths, two used and one unused. That way they'd have more space to work with in games. 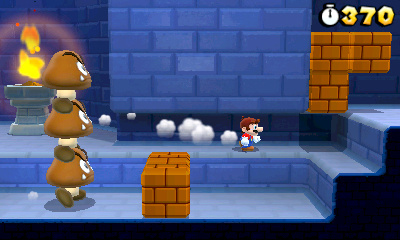 Super Mario 3D Land is a great game. Like what Nintendo did with The Legend of Zelda: Phantom Hourglass in showcasing the wonders of the Nintendo DS touch screen, Super Mario 3D Land has shown the wonders of 3D in gaming in a way that's never been done before. Super Mario 3D land was great. I think the Galaxy titles would have been much more fun if it followed SM3DL's gameplay. This clearly played like SMB 3, only in another angle. I love this game, best part is once you think you beat it you have special worldsto be unlocked. plus you can play with Luigi. Any Mario game im a fan of. This is why 3rd-party publishers say they can't compete with Nintendo. They're referring to sales, not quality.